OJEE stand for Odisha Joint Entrance Exam which is held every year under the authority of Odisha Joint Entrance Board. 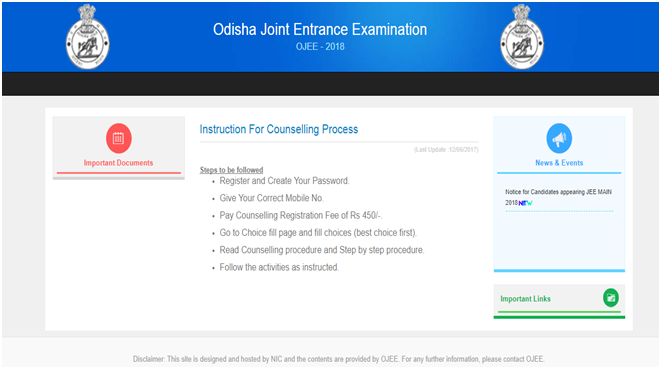 OJEE-2018 is the entry exam for degree courses in the colleges of Odisha state (private and government). The admissions to B. Tech will be done using the score card of JEE-Mains 2018 and to get admission to MBBS and BDS courses one must apply for NEET-2018 here. 1. Mathematics for 1st year Pharmacy. 2. Test for B Sc. (+3 Sc.) Lateral Entry to Engineering (2nd year). 2. Test for Lateral Entry (2nd Year) to MCA. The duration is different for different exams. The sections will be depending on the exam sitting. For every hour of the exam there will be 60 questions i.e. 60 questions-per-hour is the exam pattern. The questions will be objective type only carrying four multiple choice options. 5. Lateral Entry BSc./+3Sc (BSc/+3Sc candidate must have Mathematics at +2 level) One hour examination containing Mathematics, Physics and Chemistry. For every correct answer, 4 marks will be awarded while for every wrong answer, 1 mark will be deducted and if a question is not attempted, zero mark will be awarded. You can download the previous year question papers from the website. The age limit fixed by the Government of Orissa/Government of India/Medical Council of India will be applied wherever applicable. Domicile Certificate of Odisha will be required for claiming seat under Reservation. For admission to MBBS, BHMS, BDS and BAMS, Domicile certificate is required for all students. Also, Outside state candidates are not eligible to take admission to state govt. colleges, however, they can take admission in Private colleges as per the Odisha state rules. 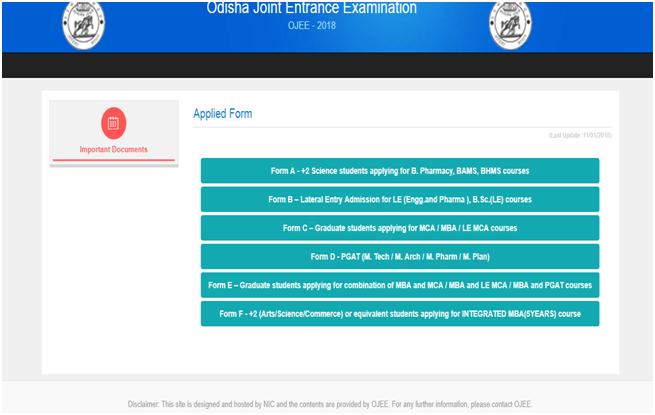 The application form for OJEE – 2018 will be available on the official website. It is available only in online mode. The expected date of the start of the online application is first week of February, 2018. 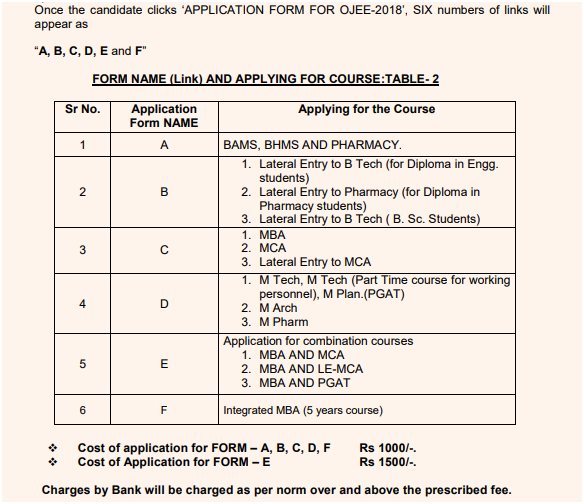 Form- E will be for students applying for the combination courses as you can see above. Form- F will be Integrated MBA for +2 Arts/Science/Commerce students. After clicking on the desired link, the following window will open which has the steps to register online which will enable you to further fill the details. The Scanned Photo size should be 5KB to 99KB and the dimensions should be 3.5 cm 4.5 cm. Also, the photo should be taken after 1.1.2018. The Scanned signature file should be 5KB to 50KB and the dimensions should be 3.5 cm 1.5 cm. The Left thumb impression should be taken on a white paper and the scanned image size should be 5KB to 50KB and the dimensions should be 3.5 cm 1.5 cm. It can be done using Offline mode as well Online Mode. For Offline mode, SBI challan will be generated through which you can pay at an SBI branch and upload the details of payment to confirm your application and generate the reference number. In Online mode, you can pay using the Debit card or Credit card. The hard copy should be preserved of both payment details and the confirmation of application submission. Forms A, B, C, D, E will be of Rs. 1000. Form F will be of Rs. 1500. One person can apply for only one form. The admit card can be downloaded from the official website within 3- 4 weeks before the exam date. The window to download the admit card will be only a week and failing which the candidate must contact the authorities. Also, in case of any discrepancies, the candidate must inform the authorities within one week. For, OJEE-2017, the admit card downloading dates were 20th – 25th April, 2017 and the last date to inform authorities was 30th April, 2017. Also, the candidate must take two copies, one which after duly signed by invigilator will be submitted at the centre of examination. Once the exam is over and the result is announced, the students will be given time to fill up the choices for counselling. Also, if the candidate wants to review his/her report card, they can do that by making a payment as decided by the authorities within one week of the result declaration. It is to be noted that the report card won’t be distributed and candidates can only get their result online on the official websites. To fill the choices the link will be available online and the instructions will be given accordingly, as was given last year, which you can see below. Also, you would need to register again and create a password and fill the best choice and make a payment to take part in the counselling process. Students must keep in account that the notification for OJEE 2018 has already been released in the month of January this year. It is important to remember that currently, 8% seats in all colleges are reserved for candidates belonging to Schedule Caste. 12% seats in all colleges are reserved for candidates belonging to Schedule Tribe. The result for OJEE 2018 is expected to be out in the first week of June 2018. Students can access it by entering their unique registration number and date of birth. Individual merit list will be released for each programme. Candidates can get more information about their results from the official website. Cut offs i.e. qualifying score for OJEE 2108 is released every year after the declaration of results. It varies every year. Till then aspirants can check the cut offs from the past years and get a rough idea. The score for OJEE 2018 is valid for a period of 1 year i.e the score for the year 2018 examination is valid for the year 2018 only. Candidates can access past year’s papers from the official site of OJEE 2018.